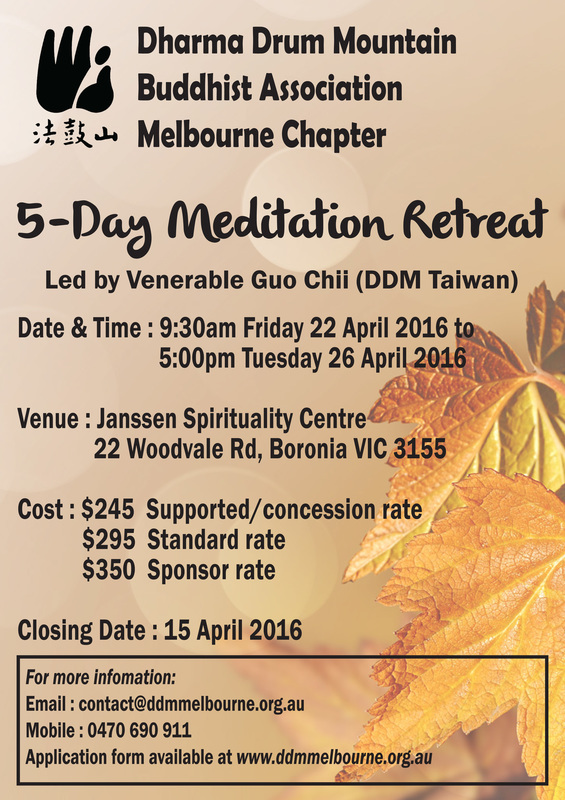 The venue, Janssen Spirituality Centre, is located in the residential suburb of Boronia, 29 km east of Melbourne, near Ferntree Gully. ​ It was the venue of our April Retreat last year. It has 19 single rooms, and shared shower and toilet facilities. The centre is centrally heated and each room has a single bed, desk and wardrobe. We suggest that you still bring your sleeping bag to sleep in to minimise the inconvenience to the centre as it is also run by volunteers. A list of what you need to bring will be provided when your application has been accepted. Generally after breakfast and lunch participants at the Retreat will be expected to undertake some tasks to sustain the environment of the retreat (called 'work practice'). There will usually be some time after the work practice for private practice, rest or showers, etc before another session of group meditation practice. From the second day we rise at around 6am, and finish at 10pm(every day), except for the last day when we finish at approximately 5pm. No dinner is provided on Tuesday 26th April. There are 3 fees options this year. The fee you pay includes accommodation and meals, including snacks.